So I had a rough night… we had a lawn company come by and give us a quote for Aerating the lawn. Apparently, they left the back gate open and my dog got out. I didn’t realize she was gone until about 25 minutes later. I thought she was gone for sure… thankfully, she was distracted by a dog about 3 houses down. My dog is a little ADD. Her first taste of freedom and she gets distracted within a few hundred feet of our house. Then I managed to clog up the drain with lots of potato skins. That was A LOT of fun to dig out of the drain. 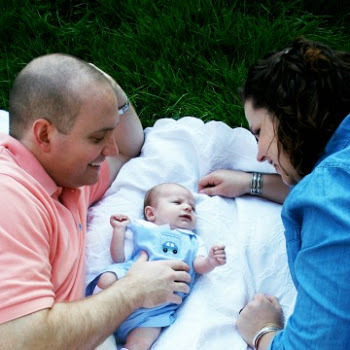 Thankfully, my sweet husband did most of the gross stuff. It’s ok… he gets to enjoy the potato soup I’m making for him tonight. She was crying out for some pizzazz… some pop… some umph… you get the idea. Martha did it slightly differently. 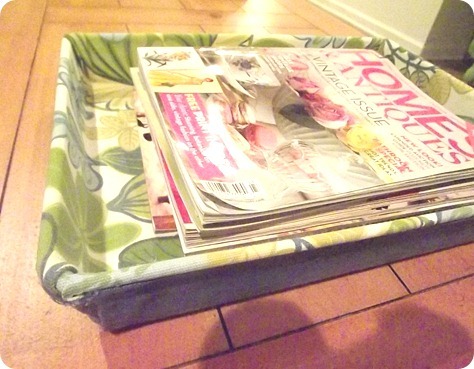 She covered the entire tray with a single piece of fabric. 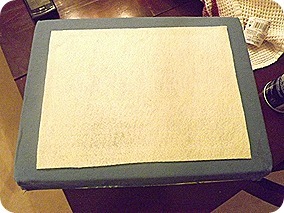 I covered the top of the tray in one fabric and the sides/ bottom in another. 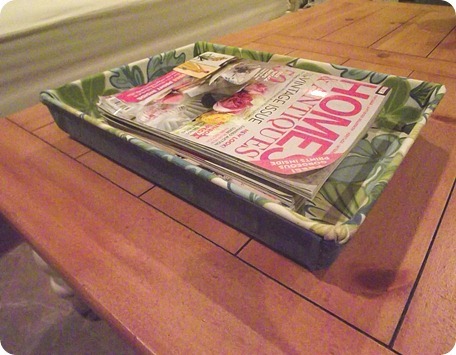 With my taller tray, it caused more wrinkles in the top piece at the corners and looked strange when I tried to pull it all the way over the side and onto the bottom. With a slighter curve to the sides, this wouldn’t be as much of a problem. 1. 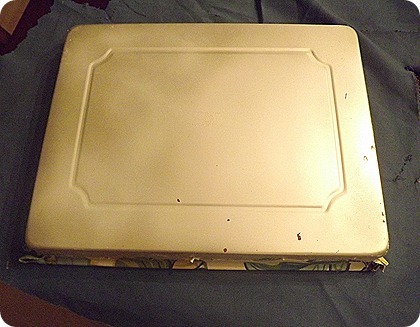 Full spray the bottom and inside sides of the pan with the adhesive. Let it sit for 30-40 seconds and get very tacky. 2. 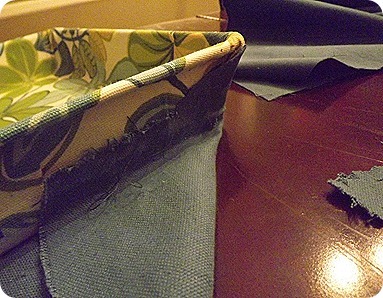 Position your top fabric as centered over the pan as possible. Starting at the top, press it into the two top corners first, then press down the center and then the bottom two corners. Do all of the bottom and the corners before connecting it to the sides. 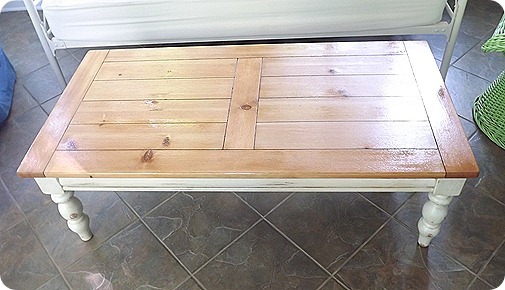 Sorry that I don’t have many pictures of this step… definitely a two hand step. 3. 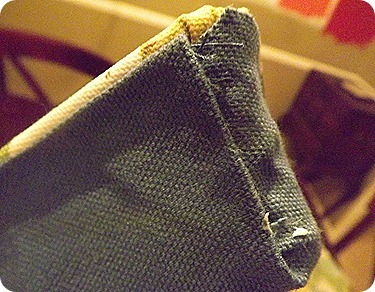 Press the fabric up the sides and over the top (spray a little adhesive around the lip if you didn’t get that before). You’ll have some excess in the corners. That’s ok, just make sure the sides are smooth. 4. Cut off the excess just under the lip. Give yourself a little allowance. Now flip it over and spray the bottom. DON’T SPRAY THE OUTSIDE SIDES YET! Press your second fabric on the back. 6. 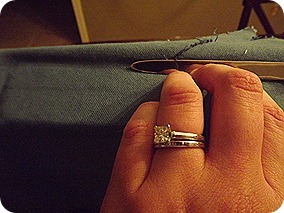 Using the Liquid Stitch, hem the top so that it’ll end just under the lip of the tray. 8. Do it again on the other short side. 10. Glue that piece down and cut off any excess. Now repeat the process we did for the short sides to cover the area that you just folded. I used a little hot glue to keep the bulky edge down. 11. 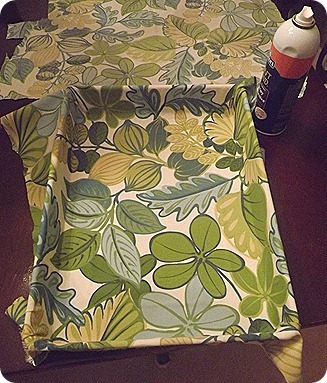 Now spray a little adhesive on the bottom of the tray onto the fabric. 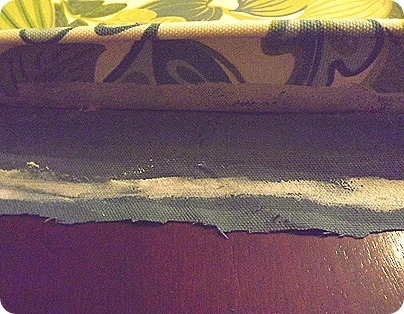 Press the felt down on the adhesive. 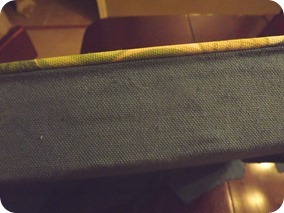 This is kind of an optional step, but it helps the tray to slide easily and not wear down the fabric. I know that seemed like a crazy amount of steps, but it was actually pretty easy. 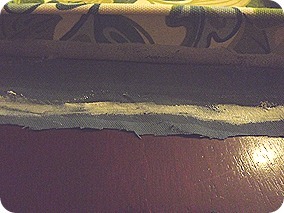 The hardest part is getting the fabric to lay smoothly on the inside. Once that’s done, you’re pretty much done. 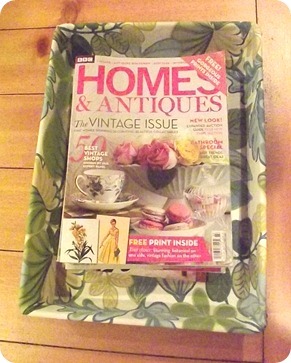 Plus my coffee table looks much happier. 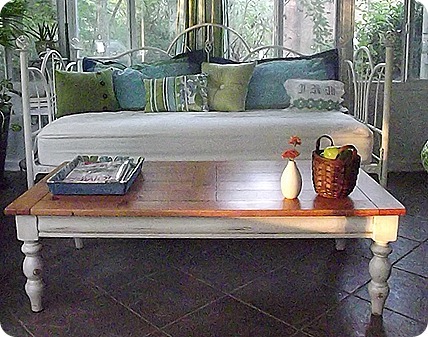 Perfect for a sunroom where LOTS of time will be spent pouring over magazines.